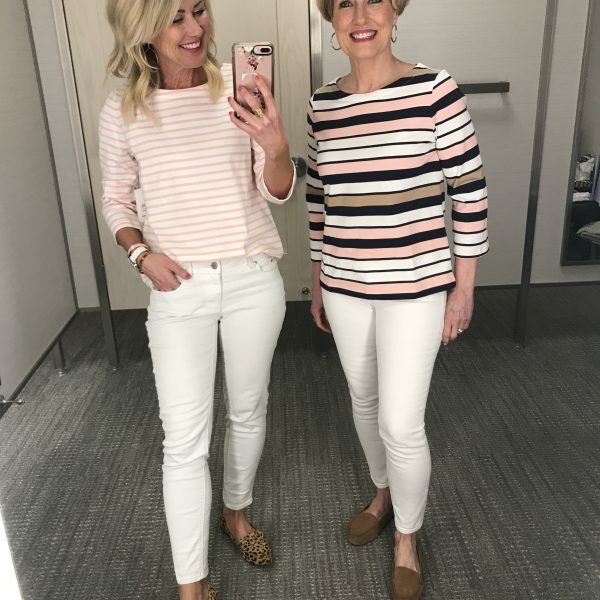 Dressing Room Diaries | The Keepers | hi Sugarplum! 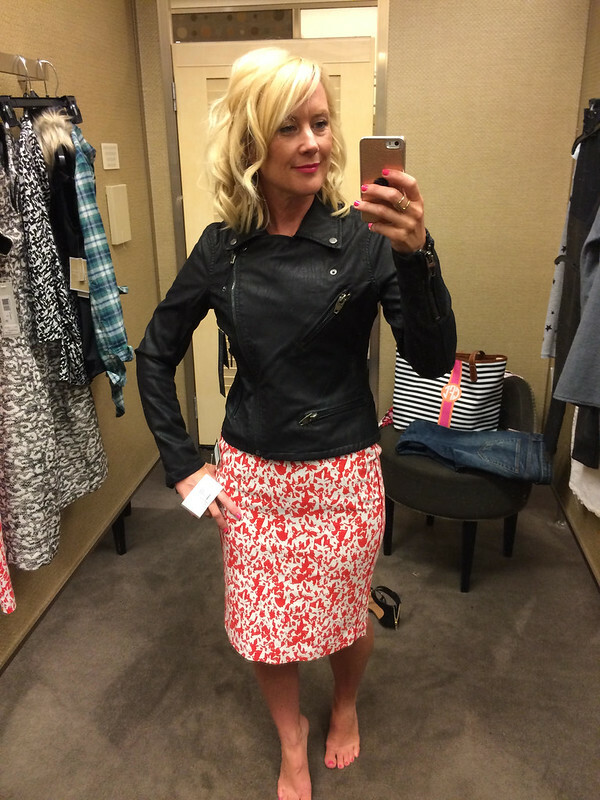 Okay ya’ll…it’s the final weekend of the Nordstrom Anniversary Sale! That means Monday it’s full price for all these darling Fall (and some Summer) pieces! And ain’t nobody got time for full price! Now is your chance to scoop up wardrobe staples for the upcoming seasons…while it’s still up to 40% off! 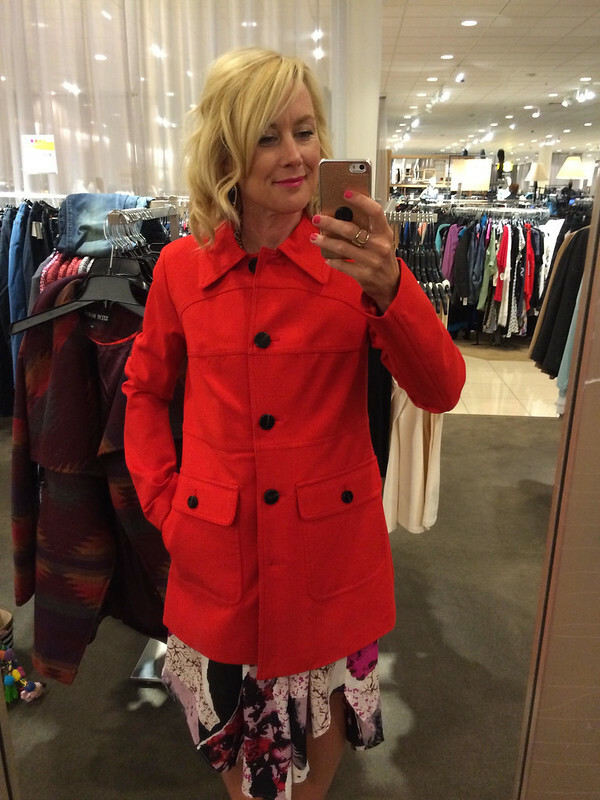 The last two Fashion Fridays have been Texas-sized Dressing Room Diaries, showing you the cutest stuff I loved most! The shots aren’t good, the lighting is bad, my hair is usually past it’s expiration,…but it’s real life, real girl, real clothes…and hopefully helpful for you to see them this way, instead of perfectly styled on a model. Today I thought I’d share what I’ll likely keep, and what I would keep if only I had a money tree. Or a sugar daddy. Either would work just fine. 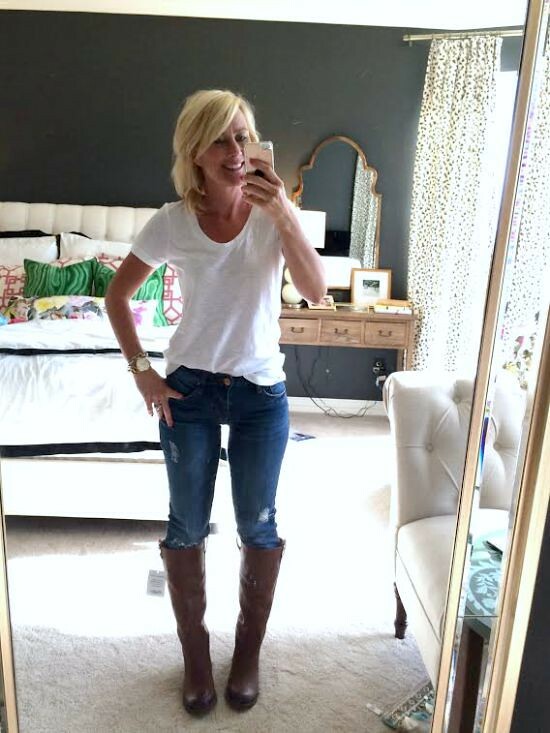 These scoop neck tees are the best I’ve found in awhile…flattering neckline and arms, loose enough to be comfy, but not so wide you look schleppy. I already had a couple of striped ones, so at $15 I added solid white and black to my collection. 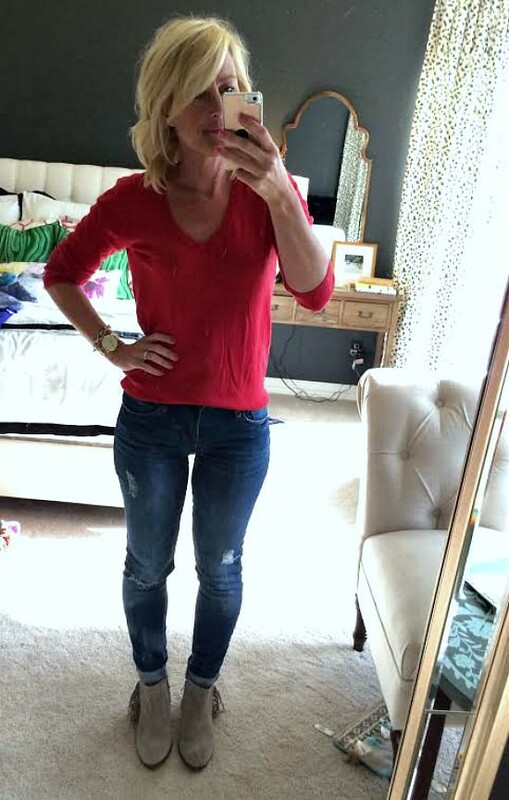 I love the slightly higher waist of these jeans (it gives the illusion of longer legs! ), the minimal distressing, no weird whiskering in the crotch and hip areas (who wants to call attention to their crotch?! ), and dark rinse. And the boots. #huminahumina The leather is soft, the footbed comfy, and the color perfection. 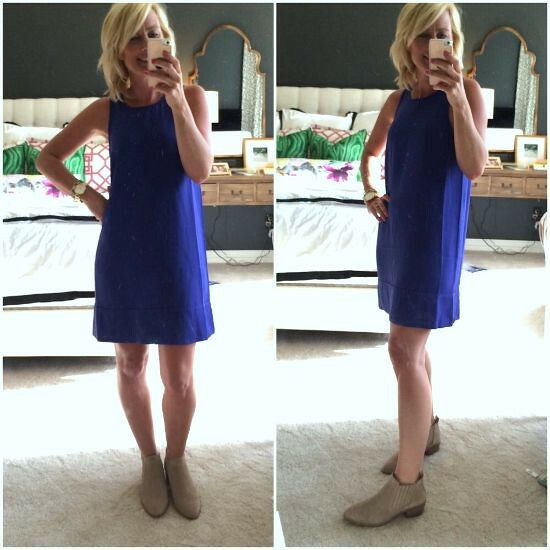 I think they are a great Look-for-Less of these much pricier boots, too! Fit note: I wear an XS in the tee, and 3 in the jeans. The boots are true-to-size, with plenty of room for my ‘athletic’ calves, but wide-calf is also available. Here’s the same tee in black, with a hit of color with the necklace (also on sale!). 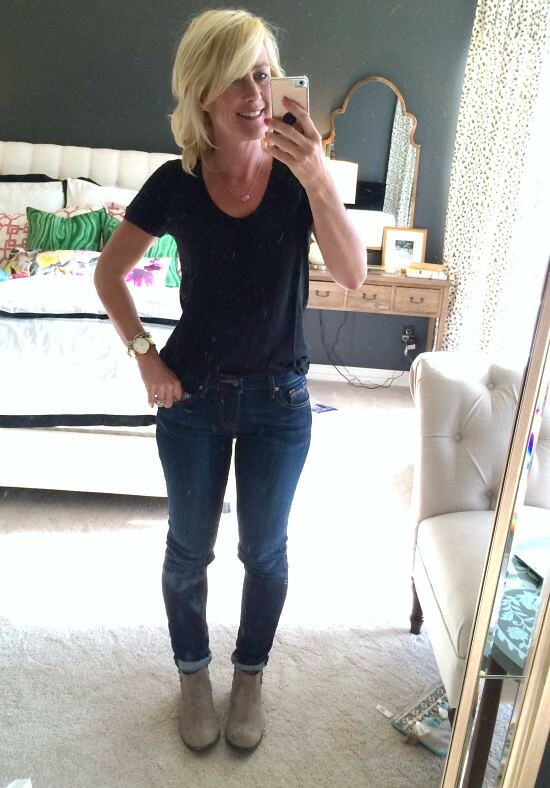 This is the other pair of jeans coming to live with me…dark rinse, slightly higher in the back (no gap or muffin top! ), and just enough stretch to keep the jiggly bits tucked in. There’s also no distressing or whiskering so you could easily use these tips to wear them for dressier occasions. So the only place I’m still undecided is the booties…I’m having a hard time narrowing down my favorites. These are by far the comfiest, with a nice cushy insole, and just enough heel height. Fit note: I wear my usual size 26 in these jeans. I could probably size down one, but I prefer eating room for tacos. And the boots are true-to-size. This pullover v-neck sweater is lightweight and a little stretchy…lots of fun colors to choose from, too. I’m wearing with the same distressed jeans as above, and another bootie contender…fringe ankle boots. Fit note: I sized up one in the sweater for a more relaxed fit, and to allow room to layer over a shirt when the weather cools down. The boots are true-to-size with thin ankle socks. 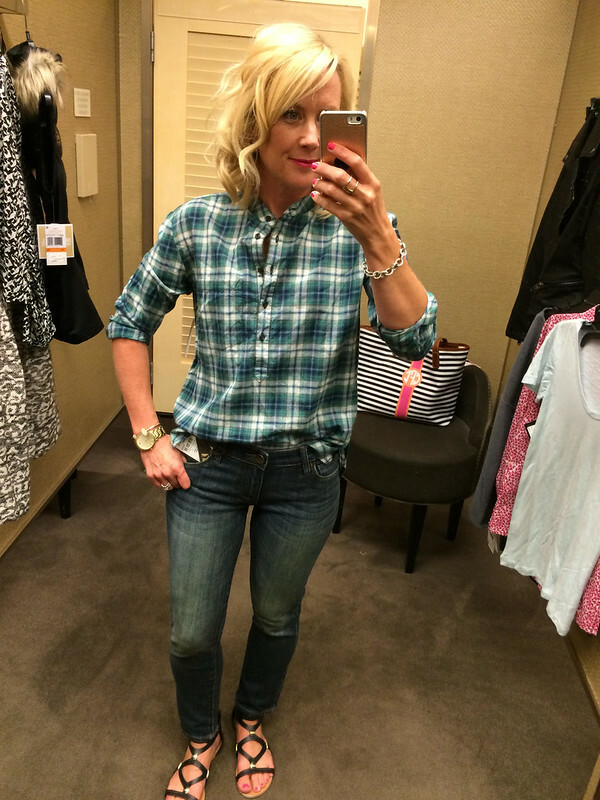 Another great staple…this washed shirt is light, flattering, and laid-back. 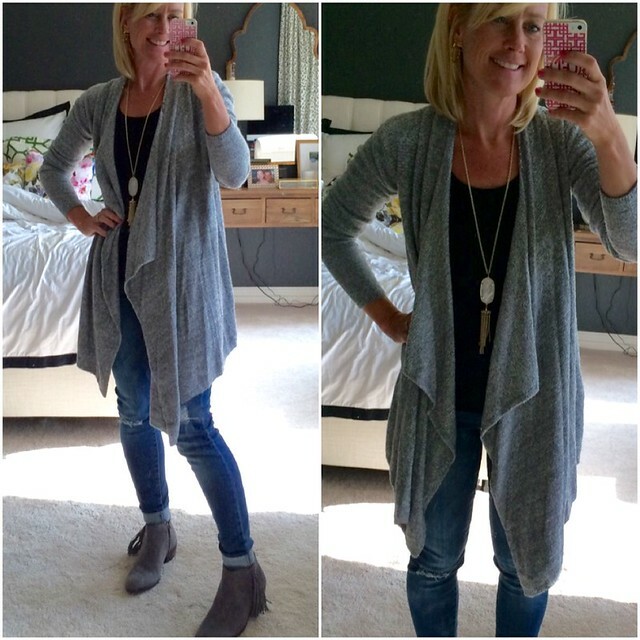 I’m wearing it with the same dark-rinse jeans as above, and the fringe booties in gray. Fit note: I sized up one for a more relaxed fit in the shirt, but my regular size worked, too. 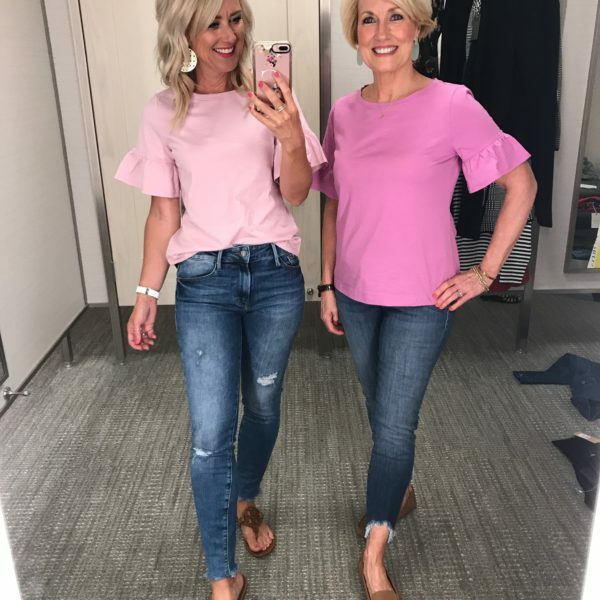 Here’s the same shirt and jeans, but with the putty colored fringe booties…which I love from the size, but not sure about the front view. Fit note: I didn’t care for the fit and length of the striped version. 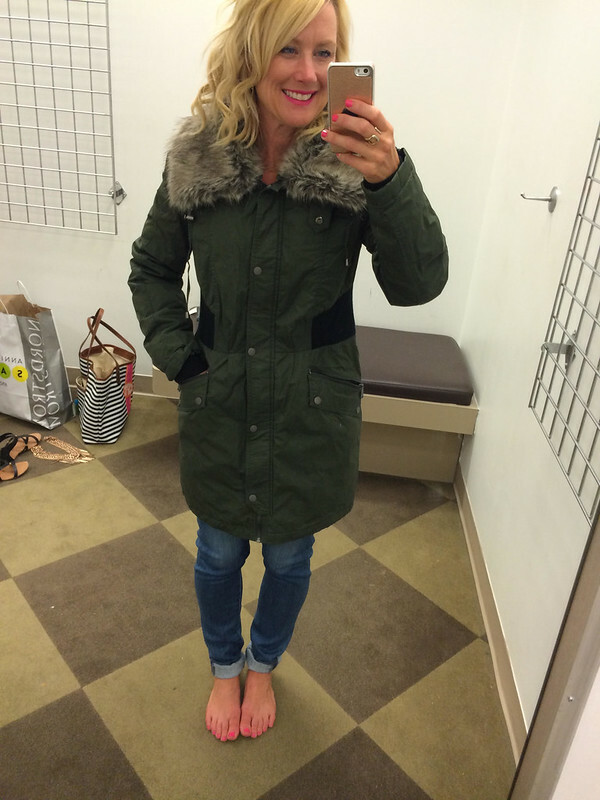 The small fits great in the solid, and would work for anyone usually an XS-Medium. 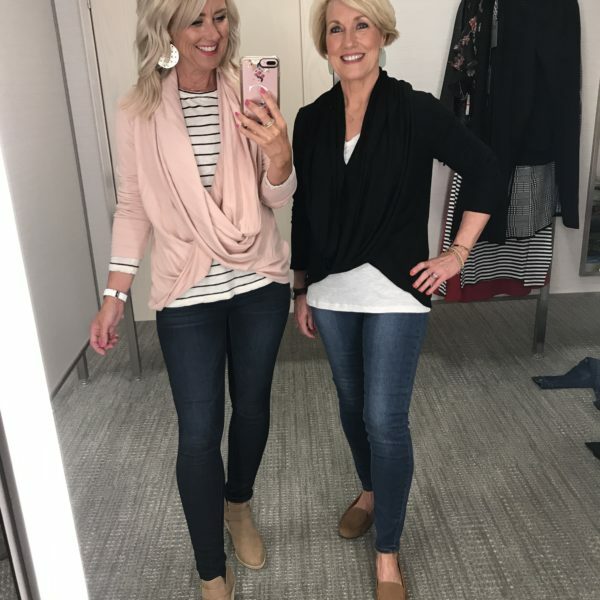 And I was surprised by how much I love these low-ankle booties…love that they show a bit of skin when worn with jeans, and are a nice streamlined silhouette when wearing with skirts and dresses. Fit note: I wear an XS in the dress…a Small does give a bit more length, but the armholes too long and the body too wide. You want it to drape, not hang like a sack. The booties are true-to-size. I don’t really need this dress, but it’s so darn comfy and chic, not to mention, a great price. It will be great to throw on for a pulled-together look during the day, or heels at night…and with booties in the Fall. 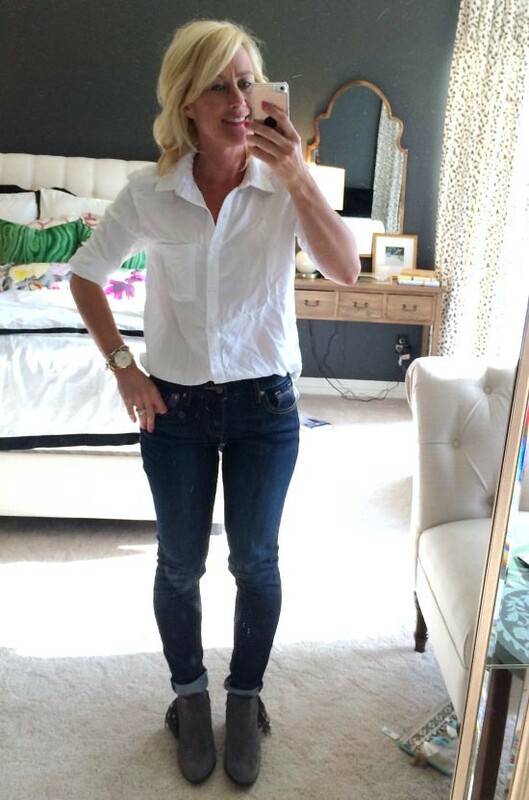 Fit note: Go with your usual size for a body-con fit, or size up (like I did here) for a slightly more relaxed look. 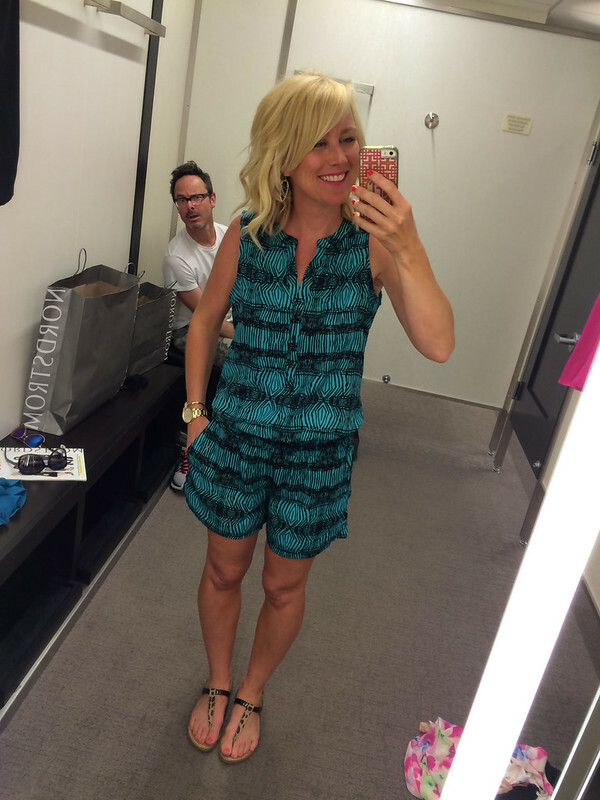 I kept this romper. And the creeper. 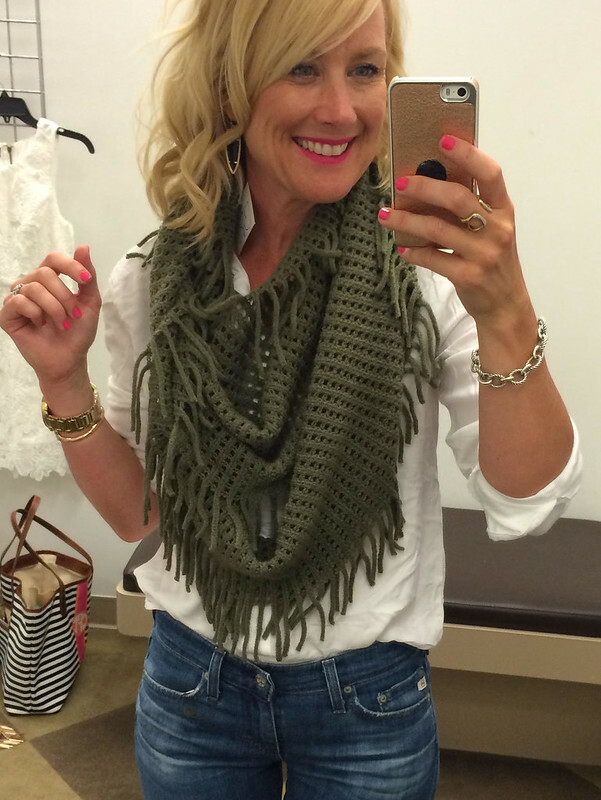 Ugh, I can’t believe I’m showing you these pics…but I love these pants too much not to share. I’m embarrassed to say they are my only workout pants…I’m hoping since they are so cute and comfy, I’ll want to wear them. And work out in them. That’s the hope anyway. But they really are great, just check out the reviews! Fit note: I’m wearing an XS. The wide waistband keeps them in place without rolling down, and there’s even a handy pocket. For what, I’m not sure. What do people tuck in the waistband of their pants when working out? Okay, now a few things that I would keep if I didn’t have kids to feed and a mortgage payment to think about. Now back to the booties…clearly I can’t keep alllll of them…but they are all so cute and create such different looks! Which is your favorite? 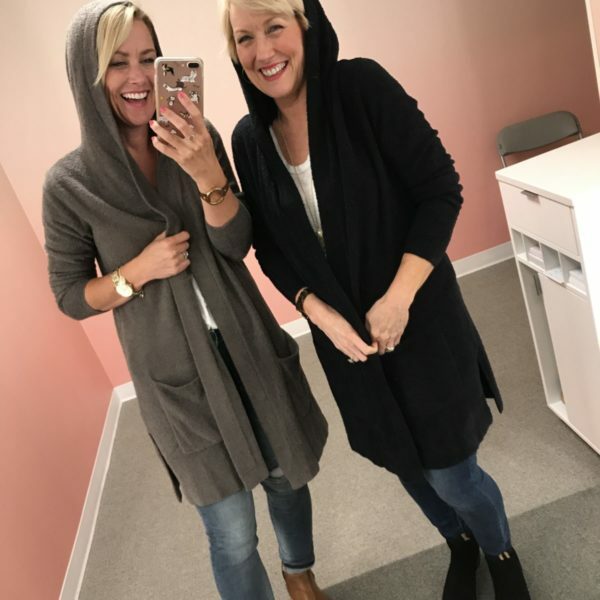 I tend to go with camel and taupey shades because they go with everything…but the gray is fun, too. As fun as it’s been scouring the sale for the best goodies, it’s also exhausting figuring out what I want to keep! #victim #sarcasm And I’m sick to death of seeing my mug in these mirror selfies…it’s time to move on! (Note to self: clean mirror, wash hair) I hope you’ve enjoyed the series, and you found it helpful in making your own selections. So tell me…which booties are your favorites…and what are your best scores from the sale?! 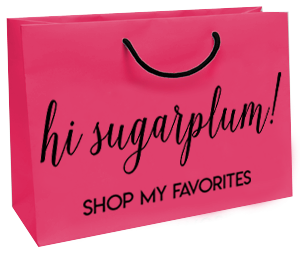 Happy weekend…and final shopping…lovebugs! previous article: Prepping for Back-to-School with The Container Store & Me! all cute wardrobe pieces! i use the tiny pocket to hold my locker key when i workout at the gym. happy friday! 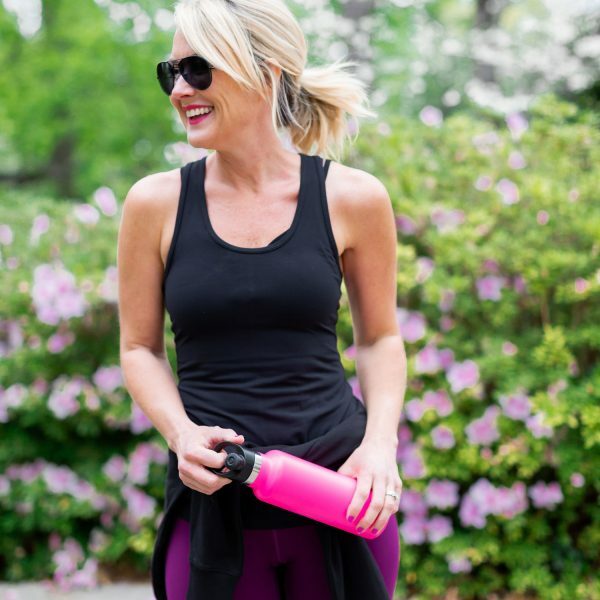 The little workout pants pocket- I use it for my keys when I go running or to my condo gym! I hat workout pants without pockets for that! 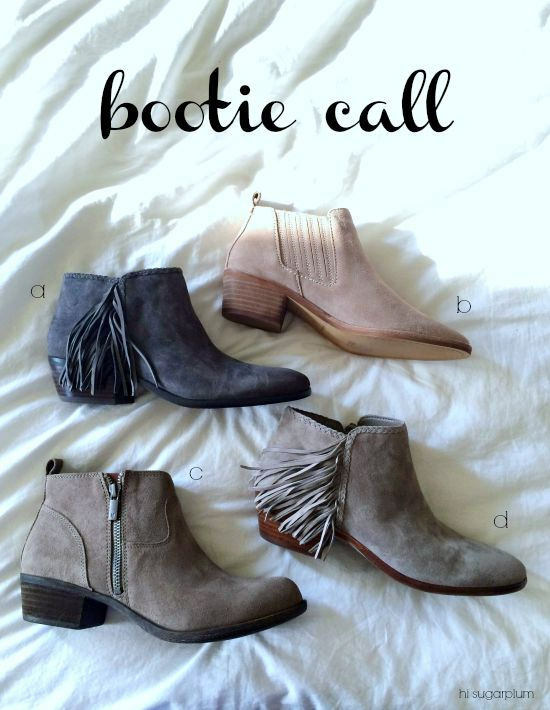 I like booties (b) or (c)–I'm not a fan of the fringe. Thanks for sharing! YOU are the cuuuuutest. Love everything you picked! I love b!! And I use the pocket in my workout pants for my keys!! Love the chambray shirt and the ruched dress. I've been avoiding Nordys for weeks but I'm pretty sure I'm going to break down and head over there today! The pocket on the workout pants is for your key. If you park somewhere and go for a run or leave from home and need to carry a key. The pocket is the best thing ever and I get so frustrated when my work out pants or shorts don't have one. Mystery solved! Gonna echo everyone else about the pocket for a key. I did a 5K race and my shorts didn't have a pocket and I didn't know what to do with my key, I didn't want to run with it in my hand! Ah the booties! I'm struggling this year. I ordered the Ivanka Trump buckle pair and there was NO cushion or support on the insole. And how does that fringe pair do with the fringe dragging on the ground? I thought about that too…but it just barely grazes the ground. If you live in an area with rough, wet Winters, they likely aren't a good choice…but for drier climates I think they'd be fine. But yes, certainly something to think about! I vote for C in the booties!! i feel like the front view is strange on the fringe ones and they look like the fringe would get dirty. I keep a key in my capri pocket when running and the car fob in it at the gym!! Depending on the pocket size, a debit card goes to so i can run an errand or two without changing! Not a fan of the fringe boots. Love the dark blue skinny jeans and the white shirt on you. You have nothing to worry about by being photographed in the workout pants! I like bootie b , bootie c looks clunky to me-which is awful since they are comfy, but I really feel you need to keep a fringe bootie for yourself. It showcases your sassy style, which is darling! Thanks for sharing! I think you made some great choices! I vote for C. so cute! Hi Cassie! You got some great stuff! I like bootie B the best, though they're all cute. Hi Cassie! Did you find those scoop neck tees to be see-through at all? I ordered a pale blue a few weeks ago and it is quite thin. Just wondering if maybe it was just the color I ordered. Thanks! I ordered a pale blue as well and it was see though and needed a cami underneath. But…I ordered the grey and white stripe and no cami is required. So strange. You’re gorgeous! And what a great (funny) husband you have, that’s something my husband would do too. Cassie, where is the new kitchen this is like a slow death!!! i USED to keep my iphone in the waistband pocket, but theyre generally not iphone 6 sized so now its just for my house key when i run!